You can start saving from Day 1. 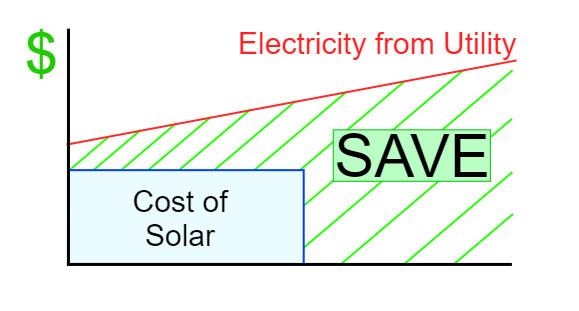 As electricity rates rise, your cost of electricity does not once you lock in a low rate investing in solar. Today, solar energy is a smart investment for homes and businesses of all sizes. It’s true… the technology has been around for a long time in toys, calculators, and on spacecraft, but it was never popular for general use. So what happened? In this article we dig into the history of solar a little bit and show you that although the technology has been around for a long time, this new trend to power homes and business with energy from the sun isn’t just a fad: it’s here to stay. The photovoltaic (PV) effect (which is the term for the creation of electric voltage in a material when that material is exposed to light) was first discovered in 1839 by a French scientist experimenting with electricity generating chemicals. This PV effect is the same phenomenon which today’s solar panels are taking advantage of to create electricity for millions of consumers all over the world. These first solar cells became available for purchase in 1956 but, even though they were extremely inefficient, they were also extremely expensive – costing about $300 per watt. Even still, many product developers were inspired by the new technology and used solar cells in novelty toys and radios. By the 1960’s solar panels were the standard method of powering spacecraft due to their light weight, lack of moving parts, and ability to function extremely well in harsh environments. Although space flight was a big priority at the time, it was a relatively small industry and solar technology prices remained too expensive for consumer use. In the 1970’s Exxon researchers developed a way to lower the cost of manufacturing solar cells while the company was exploring the use of technology to harness energy sources other than fossil fuels. They did this by using multiple silicon crystals instead of the previous way using a single silicon crystal to make their solar cells. Today we know these two different technologies as monocrystalline (single crystal) and polycrystalline (multiple crystal) solar cells. These new polycrystalline solar cells reduced the cost of building solar panels by 80%, or from about $100 per watt to about $20 per watt, and Exxon began using this technology to help power off-shore drilling rigs. Solar technology began being used in all kinds of residential, commercial, and government applications where line-fed electricity was not a favorable option. Then, in 1973, the University of Delaware built the first net-metered home. Today, solar installations are taking off in every corner of the world, not just North America. Countries like Germany, India, Saudi Arabia, Brazil, and Australia are all investing heavily in solar energy. In the United States, solar industry growth is now outperforming the overall U.S. economy by 17 times. The solar industry has achieved a growth rate of 25%, making it responsible for about 1 out of every 50 jobs created. Florida is even now within the top 5 job-creating states for solar energy, with solar-related jobs increasing by 26% in 2016. Take advantage. Get Started Today. The current combination of low manufacturing costs, high-growth installation companies, multiple solar loan programs, and exciting financial incentives, make investing in solar energy now better than it ever has been and maybe ever will be. This opportunity is not only socially responsible, but very low risk as well. The financial benefits of solar are based in science, not volatile stock prices or market fluctuations. Plus, you get the added social benefits of reducing your carbon emissions and owning a piece of technology that will likely change the future of our species. So how do you take advantage of this buyer’s market for solar? Contact one or more of your local installation companies as soon as possible to try and schedule an opportunity to get an assessment. Or, in order to save yourself a lot of time and energy (or if you’d just like a more personal experience), here at Uptown Energy Solutions we’ll give you a complete solar education, gather real proposals for you, do a complete engineering analysis, and manage your entire project for a small, affordable fee.